The Decorating Diaries: Decorating With Old Drawers and A Fun Day of "Picking"
Decorating With Old Drawers and A Fun Day of "Picking"
A few weeks ago I got the opportunity to do some "picking". A hundred year old electrical company went out of business. The company had a 10,000 square foot warehouse stuffed to the ceiling with who knows what. I took gloves and a flashlight and got to work digging. Most of the stuff was related to lamps and wiring, but what I fell in love with was the office supplies and old drawers that were everywhere. These green drawers were just too cute. These drawers held nuts and bolts and whatever else you may need to fix lighting. I painted three of the drawers white and painted on numbers. And don't you just love those spools of string? The next drawers were the same as the white ones except they had the paper labels still on them. I decided I needed to keep these. They are on a shelf in my family room. I also found these drawer labels and holders that I put in a jar. And finally, these two tall drawers were also painted white and given a graphic from the Graphics Fairy. I had so much fun digging through all that junk even though I was a little nervous about finding little creatures. At the end of the day, the man in charge said they had found such creatures dead and alive. I'm glad I found out after I was done! Oh, I just love everything that you have found! What lovely vignettes that they all made. Glad you didn't run unto any critters!! Wow! Those are so cool. I just love the look of it all. You have a great eye for vintage design. Love your creativity! Any of the cute old labels for sale? Love digging for treasures! Nice finds. Love old drawers and paper goodies. Coming over from Knick of Time Tuesday. Great finds... love old store stuff. You have made some nice displays. Wow, what luck you had getting all of those - I love every single one! Al the labels and price tags are "priceless" as well. Thanks so much for sharing at Knick of Time Tuesday - I'll be featuring you next week and there will be an "I Was Featured" button waiting there for you! Wow, what a wonderful opportunity. I would love to hear how that came about. Were there others there digging or just you? How fantastic that you were able to bring home all those cool drawers and such and I just love the way you've put it all together. Beautiful! PS: I'm now following and hope you'll stop over at Quirky Vistas and do the same if you like! I love the drawers with the paper. Love your ideas using the drawers! Very on trend and gorgeous. I'd love for you to share it at my blog party, Twirl & Take a Bow at www.houseontheway.com. It's every Tuesday and runs through Sunday. I love for you to stop by! Love this! The numbered tins are cute, too! I would love if you came by to link up to my party happening now! I can't even tell you how much I love this! First of all I'm a HUGE fan of stenciling things! Never thought of stenciling drawers and using them for decoration! I just love it! I always drool over old crates at antique stores, but I can get such a similar look with this idea! That's it, I'm going to start scavenging through my basement for drawers so I can try this! I love old drawers wire baskets and use them for storage. I like everything nice and organized. Thank you for sharing your nifty finds at Potpourri Friday at 2805! OMG! You found some fabulous stuff!!! I love all your vignettes too! Oh what fun! I love the cute drawers you picked out. I love digging, too, but always have the fear of spiders jumping out at me! :) They so freak me out. I love everything that you got...omg! I especially love the white drawers with the numbers you painted on them. I love what you did with all the drawers. I, too have a thing for these little wonders. ps, glad you didn't run into any lil creatures. What a fun pick! Great finds, and you've displayed everything so nicely! The adventure certainly paid off. The drawers were a great find and the vignettes you created are very attractive. My favorites are those labels! found you via the charm of home and hope you'll stop by and follow! Great vignettes created with those old drawers. Thanks for sharing at Wow and this will be one of the features tomorrow night. That was an awesome pick! I love all the drawers as well as the spools of string and the price tags. You've put up such beautiful vignettes using your great finds. I've just sent you a private e-mail. I really want to go picking with you. These are some amazing finds. My favorite drawers are the ones with the price tags on them. Love. Love. Love. Visiting from Savvy Southern Style and following you now, too. Oh my...you hit the jackpot with these treasures! Love them all! Great looks with these old finds! Thank you for joining me at HSH! I am featuring this today. Thanks for the great entry to HSH! Beautiful pictures. I love all of these great finds. I have a link party on Wednesdays, and I would love it if you would link this and any other posts. It is called Wednesdays Adorned From Above Link Party. It runs from Wednesday to Sundays. wow! this is a dream pick! love what you found! Hi! 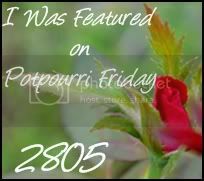 Just in case you haven't seen the news, you have been featured at Potpourri Friday at 2805! Absolutely love the blog, we work with a small budget too, so everything is DIY, newest follower here, can't wait to see your other projects.